I hated beets growing up. In fact, I didn't eat a beet of my own volition until I was 28 years old. It was roasted and served with soft goat cheese. Not surprisingly, I was hooked. It's no wonder I didn't want to eat the electric pink pickled ones that my mom served from a can (love you, mom!). Why would anyone violate a beet in that way? Since I discovered the deliciousness of roasted beets, I am completely devoted to them. On pizza, roasted with other root vegetables, in latkes, and even plain. But my favorite way to have them is in a salad. 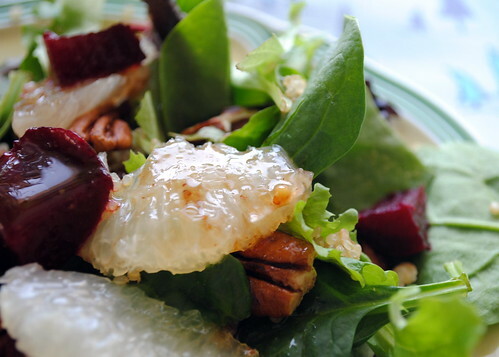 If there's a beet salad on the menu, I'm getting it. In the past we haven't eaten a lot of salads at our house because Navah's not a huge salad fan, but I'm bringing them back. And this one's at the top of the list. It's hearty enough to serve right alongside any winter meal, and it's substantial enough that you could have it on its own. Drawing from the fruits and veggies that are great this time of year, it's the perfect salad for a winter weekend brunch. We had ours alongside my vegan tofu scramble for dinner, and I liked it so much I had it again for lunch! In fact, it was a winner all around. The non-salad lover said - and I quote - "There's nothing about this salad that's not good." The power of a double negative, my friends. I think that says it all. 1. Preheat the oven to 375 degrees. Rinse the beets and then place on top of a piece of foil large enough to fold over and make a sealed foil pack. Drizzle the beets with olive oil and then seal up. I place my foil pack on a cookie sheet to avoid spills. Place in the oven and roast for 30 minutes to an hour (check in on them at 30 and see how soft they are. If they need more time, continue checking every 10 minutes or so. Different ovens will vary). 2. Once the beets are cool, the skins should just slip right off. I had to remove some of mine with a peeler. 3. 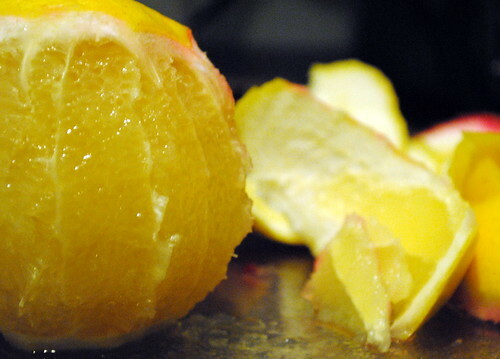 Cut off the peel and pith of the grapefruit, and then slice each section so that you get just the fruit and none of the membrane in between. 4. 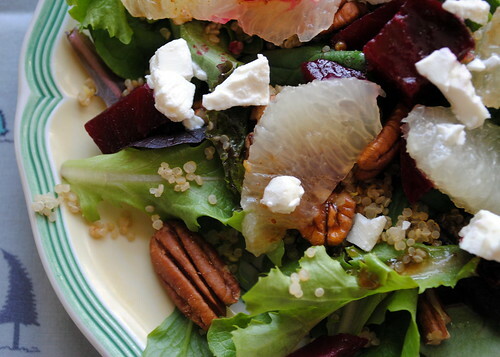 Mix the mesclun or spring mix, the quinoa, the beets, the grapefruit sections, and the toasted pecans in a bowl. Add the crumbled goat cheese if you're using it. 5. Wisk together (or shake in a mason jar, like I did) the maple syrup, olive oil, water, and dijon mustard. 6. 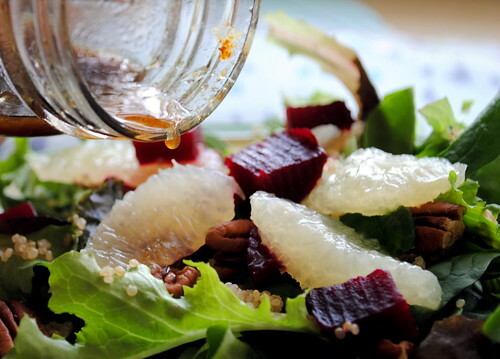 Pour the dressing over the salad, toss, serve, and enjoy. This one was hard, and I'm going to have to get all kindergarten teacher up in here and say everyone was a winner. Sorry for the competitive among you, but the team playing in this one can't be beat. Each ingredient complements the others so thoroughly that it would be wrong to single out any one. Everybody gets a trophy! Have a wonderful weekend! And let me know if you make the salad. I love to hear about how these things turn out!